You've seen them on TV - you've seen then on the road, now picture yourself on one of our pocket rockets. Our pocket rockets are made with quality parts that you will feel the moment you ride one. Quality craftsmanship with Japanese technology and European styling make our pocket rockets literally stand out from the crowd. Our pocket rockets are serious vehicles. Not only do they look good but they perform even better. Our pocket rockets are low to the ground racing vehicles that deliver one fast ride. A pocket rocket from MiniPocketRockets is even more fun to ride than the rest because our pocket rockets provide an unbeatable performance. All our pocket rockets come standard with sensational looks, knockout performance and an affordable price. The concept of the pocket bike began years ago in Japan, a country known for miniaturizing full-scale products. As crude mockups of the first pocket bikes were developed and ridden, a brand new trend and following developed. As the sport spread into Europe, Italian manufacturers began research and development into producing high quality racing minimoto bikes. Throughout the years, the combination of Japanese innovation and Italian craftsmanship produced ultra high performance pocket bikes. Until recently, quality pocket bikes were largely unavailable to the casual rider. 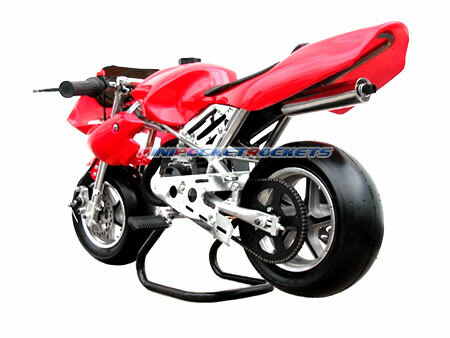 Prices of pocket bikes reached upwards of $4000. These astronomical costs were mainly due to research and development costs to provide optimum frame geometry, motor configurations and dimensions. Today's manufacturers are able to use the information pioneered by these Italian and Japanese companies and develop pocket bikes that are essentially configured the same way including motor setup, frame geometry, braking systems, etc. Because these upfront costs were avoided, prices of these high quality pocket bikes have come down over the years. Due in large part to the Internet, and their affordability, interest and enthusiasm for the pocket rocket has exploded. But don't be fooled by imitators and knock-offs. Quality is the key, when it comes to your purchase. At MiniPocketRockets, we stand firmly by our products. We've sold tens of thousands of these products and have been the trusted source online for pocket rockets for over four years. We know that you want to spend your time riding your new pocket rocket, not fixing it because of inferior parts. From our no frills Cagllari Daytona pocket rocket, to our top of the Line X18 Super Bike, the welding and manufacturing of our products is second to none. Many of our pocket rockets reach top speeds over 35+ mph. We have been in business so long because we care about every pocket rocket we sell. We want YOU to be riding your next pocket rocket from us. 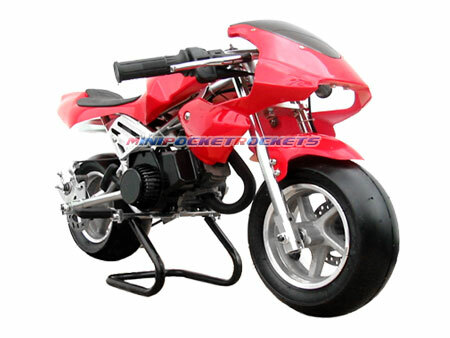 Dare to compare a MiniPocketRockets pocketbike to any other brand. Order your new pocket rocket from MiniPocketRockets today. We offer a full range of products and accessories to complement your purchase of a new pocket rocket. When ordering your new pocket rocket, you will have a wide range of colors and styles to choose from. Everything from our light weight, no frills Cagllari Daytona pocket rocket to the classic and sleek Vulkan mini chopper. Your new pocket rocket will arrive on your door fully assembled and the do-it-yourself performance parts can be added in a snap. We also carry a full range of safety accessories for your new pocket rocket. We carry elbow and knee pads, as well as designer helmets, to fit your distinctive style. We know that once you order your new pocket rocket from us that you'll want it fast. That is why we ship all orders within 1 to 2 business days. So, if you can picture yourself on a pocket rocket tomorrow, flying around at breathtaking speeds, don't delay. Get your brand new pocket rocket today.